These wounds are commonly known as 'gashes, tears or cuts' of the skin. The skin surface is split or torn following blunt trauma, and the force causes the full thickness of the skin to be damaged. Lacerations therefore bleed profusely. Areas of the body that are commonly the site of lacerations are those with underlying bony support, such as above the eyebrows, on the scalp and face, or over the knees etc, whilst they are less common on areas of the body that are softer such as the buttocks. Contact with motor vehicles may also cause splitting of the skin due to grinding type movements over the surface. 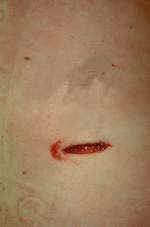 Incised wounds are sharp cut-like injuries, made by knives or broken glass etc.The edges of the wound will vary according to the nature of the cutting edge of the object, in that a razor will leave regular margins, whereas an axe may leave the wound margins crushed and bruised, resembling a laceration. 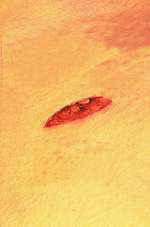 These are wounds where the length is greater than the depth, eg a slice wound across the skin. If the wound involves major blood vessels, it can be life threatening, but in general, they are not as serious as stab wounds. These are wounds where the depth of injury is greater than the length. They penetrate more deeply than slash wounds and tend to come into contact with vital organs in the chest and abdomen.Stabbing is the most common mode of homicide in the UK, due to the strict control of guns.Stab wounds are caused most obviously by knives, but are also caused by bayonets and swords, as well as scissors and even blunter instruments such as screwdrivers. They are usually slit-like, but when the object is removed the skin contracts slightly, leaving a wound that is slightly shorter than the blade width. The centre of the wound often widens. Most knives are single edged, and have a sharp cutting surface whilst the back of the blade is blunt. The wound may be sharp at one end, and blunt at the other. Unfortunately, this is not always the case, as the blunt edge of the knife may split the skin, and resemble a double edged knife wound. It is important to realise that stab wounds can be made with minimal force. The important factor is the sharpness of the tip of the blade - once it has penetrated clothing and skin, remarkably little force is required to follow through and create a deep knife wound. In addition, the faster the stabbing action, the easier it is to penetrate skin. palmar surfaces of the hands, where attempts have been made to grab the knife blade.